February 25, 2014 marks the 28th year commemoration of the first EDSA People Power Revolution. Incidentally, netizens are also urging everyone to participate in an alternate propaganda instead and that is for Black Tuesday in order to protest online libel. Which will you choose to support? Unfortunately for me, I’m on a school trip. However, my thoughts are one with Internet citizens who are clamoring for a change against the new online libel law, yes, even if it’s already decided by the Supreme Court. I do understand the essence of EDSA 1. I’ve probably cried every year watching documentaries about it since elementary school days. But today, after EDSA dos and tres, I no longer believe in what the first EDSA revolution fought for. After all, the Philippines can even be considered on a regression instead of a progression with all the political controversies including the PDAF scam on the news these days. Frankly, this country was more economically developed during the time of Marcos as compared to today. It’s now left behind by other Southeast Asian nations when this nation used to be more progressive than them. Supposedly, it is because there are more corrupt officials nowadays than during the Marcos regime simply because it was allegedly only the Marcoses who were corrupt (note, I only said ‘allegedly’ :) at that time. But today, corruption seems to be (note again, I said ‘seems to be’) present in all sectors, bureaus, and hierarchy of the government. See? I can’t even utter an affirmative statement without worrying about online libel! ;) How is that for suppression of the human right for expression? In relation to online libel, many had resorted to name calling the author of this law, Sen. Tito Sotto and as always, our proclaimed heroine Sen. Miriam Santiago is to the rescue. Although the respective Sen. Sotto belied any accusation that he authored the law to vindicate himself from bloggers who criticized him for his supposedly plagiarized speech, we cannot be assured enough that the law isn’t intended against those who make a habit of regularly criticizing the government in general or specific officials at that. 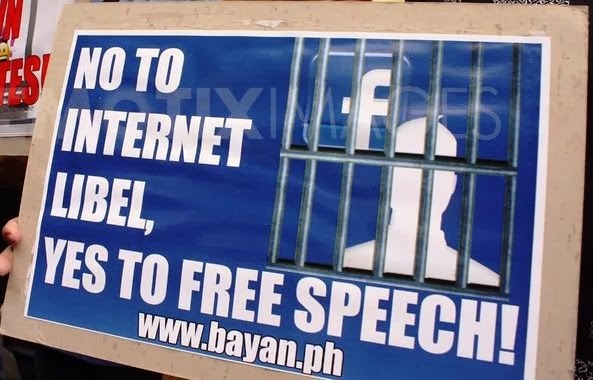 Thus, many of us side by Sen. Santiago instead and everyone who believes that this law prohibits everyone online from merely expressing their opinions especially since we all love doing so. We become instant lawyers, litigators, police investigators, scientific experts, debaters, commentators, reporters, analysts, and what not, all in the name of argument all over social media sites.